Our ‘busy’ – yours and mine – may not always look the same, but no matter what outfit it’s wearing, busy has its set of challenges. ‘Busy’ demands that we set priorities and make plans to make sure they are honored. For me, to be successful at completing whatever ‘busy’ looks, it means making sure the 3 Pillars stay standing. Specifically, that means healthy food, staying fit, and doing my best at keeping a good frame of mind. It’s been quite an October around here. Final review of the manuscript for my book Fit Quickies: 5 Minute Targeted Body Shaping Workouts (Penguin Books) has been completed, (I’m receiving some amazing endorsements, and I can’t wait for you to see them! 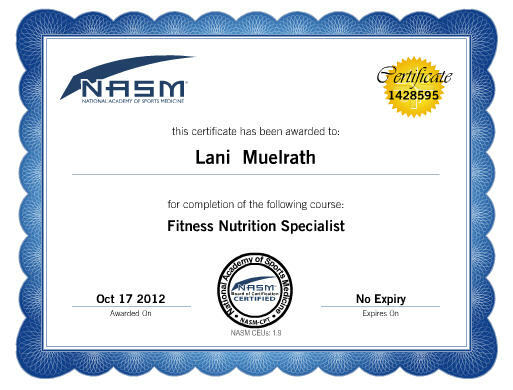 ), and I completed requirements for a brand spanking new credential – Fitness Nutrition Specialist Advanced Credential with the National Academy of Sports Medicine (I took a picture of my certificate for you). All while traveling on a long-planned scuba adventure. And did I mention that my website is undergoing its metamorphosis to a new look with new features that I’m cooking up just for you (stay tuned)? Remember, just because I teach and coach healthy food and fitness doesn’t mean it’s my birthright – I have to earn it with each bite and footstep just like you do. Here’s how I kept the 3 Pillars together during the last 3 wild and woolly weeks. 1) The Food: When at home, the routine for keeping a healthy whole foods, low fat plant-based diet perking is an easy routine. What about when you find yourself on a dessert island off the coast of Venezuela, with only enough room in your gear-jammed luggage to pack a little oatmeal, a few Lara Bars, and a 3 pound bag of brown jasmine rice? Luckily the island is an outpost of the Netherlands – the Netherlands Antilles, to be exact. And with a solid population of Dutch on the island and regular flights from Amsterdam, there is some demand for real food from which I can choose at one or two local markets. In that 2 weeks time the 2 of us plowed through 4 bags of muesli (I’m starting with breakfasts to see what I can recall for you), 3 hefty papayas, 3 heads of cabbage (just hit lunch), 6 cans of 3-bean salad (no oil, of course! ), 4 bags of chopped dark green and yellow veggies, 4 loaves of whole grain bread, black beans and lentils, 1 lb bag each (made 2 full batches of my World Burger – recipe soon! ), about 10 tomatoes, 1 onion, 2 giant bags of frozen mushrooms (just landed at dinner), 4 large bags of assorted frozen veggies, 3 lbs of brown jasmine rice, 4 bags of pasta and one jar of pasta sauce, a giant sack of potatoes, 2 cartons of frozen spinach (I invented a super sauce for the potatoes with cooked frozen spinach, nutritional yeast, and seasonings from a McDougall Soup in a Cup), a large bag of frozen berries, 2 cans of enchilada sauce, a few carrots, mustard, a jar of mango chutney that looked irresistible, and some dark Dutch chocolate with hazelnuts. Looks like a lot of food, doesn’t it? Remember, when eating a plant-based diet that is low in fat, you can – and must – eat lots of food. Definitely one of the perks. It also means you can’t leave it to chance. I didn’t. And because I planned well, and avoided falling into the traps that gained me 2 pounds last time we took this trip (see How I gained 2 lbs. in 2 weeks & lost 2 lbs. just as easily), I returned home without a gain and maybe even 1 pound lighter – we’ll see how the scale shakes down in a day or two. 2) The Fitness: This was an active trip – we were usually in the ocean paddling around with our bubbly friends beneath the waves for up to 4 hours a day. This means some kick time and thermogenesis created by the body’s drive to keep a stable core temperature. Even if the water is 82 degrees, it’s not 98.6 and your body works hard to keep that homeostasis. It’s passive calorie consumption. I also pulled out a few Fit Quickies out of my hat every couple of days to keep my shape – after all, this is where the concept for Fit Quickies originally took form. And I relied on them a LOT during the transit portions of the program on planes, in airports, and hotel stops. Next time you are in an airport, take note – they are goldmine of railings as bars for a quick Fit Quickie or two. I even came up with a couple of new ones. And Fit Quickie #10, Legs Into Play, is custom made for airplane aisles. You can even do it seated in a pinch. 3) The Frame of Mind: In the midst of all of this I had the demands of completing a full review of the Fit Quickies book manuscript and added the Fitness Nutrition Specialist Credential program to my plate. I’m not complaining. Still, the scenario demanded that I stay connected with some semblance of equanimity to get the job done. This is where many people fall short – we focus on the food, maybe the fit, hopefully both, and leave the mindset to chance. Big mistake (big tip). Whenever my anxiety started to climb about getting it all done, first I’d check in with my body and watch the wave of thought as it played out in physical tension. Getting back in my body this way always helps me settle down. Then, I’d shift my perspective to one of possibility instead of anxiousness as a perspective. Just the effort here makes a difference. And I’d do my Willpower Workout (see 5 minute anti-anxiety paint and willpower workout: How to meditate in 5 simple steps). Not only that, but scuba – in warm waters with little current and good visibility – is inherently a relaxing activity. After all, you’re breathing as slowly as possible and floating around in slow motion. Picture yourself inside the aquarium waters, face to face with those brilliantly colored, often hilarious fishes. It’s a sport with meditative side effects. To show you what I mean, Greg made this amazingly relaxing video of our adventure. If you’ve got a minute, click play and count it as a fulfilled requirement on your mastery of mindset training for the day – you can’t help but relax with the music, the turtles, the lobster, the waves! Now it’s your turn – how are you addressing the 3 Pillars today? Tell me about it in comments below. Even if you pick just one. P.S. When I enrolled in the Fitness Nutrition Specialist course, I was a bit concerned as you can imagine. Would it reflect the cutting edge information about a plant-based diet? You know I’m not going to tell you to have steak and eggs for breakfast, right? I was very pleased to see how current and progressive the course material actually is. Besides underscoring the importance of whole foods, vegetables, fruits, and beans in the diet, there was even a ‘green’ thread that played out throughout the text. A nutrition course that considers the environmental impact of what we eat. Who knew! All the better to serve you – I’m so excited to have this new feature to add to my credentials! Are you getting all the news that’s healthy, happy, and fit? Click here to join 1,000′s of others + get your health, body shaping and food updates for free from the Plant-Based Fitness Expert. OK – wakeup call. I’m one of those who easily forgets about the third pillar as you call it. No wonder the food and exercise fall apart after awhile. Thank you for the reminder, and for the link to the willpower workout article – it seems pretty simple! LOVED the video! Beautiful and relaxing. And thank you for sharing the food list – I always like hearing about exactly what you are eating! Thanks for sharing your thoughts, it means a lot. Loved the video…thank you for sharing! Congrats on your new fitness credential! And you do serve us so well. Thank you for all you do for us! What good cheer and kinds support. I love being on this journey with you. I am so happy for you. You are awesome. Susan, well, you made my morning! Thank you! More for all of us! Mazel Tav! You continue to inspire me! Hi Sylvi! Thank you for your sweet sweet note! We inspire eachother. I LOVE the peaceful video. Thanks for the share. I need to work on Pilar #3. Mostly that I don’t know how to relax very well and find myself not so alert when I’m working during the day. Thank God I work from home, so no one sees me dozing at my computer. I was reminded by Deepak Chopra yesterday (caught him on an Oprah episode) that I really need to learn how to meditate. Gonna check out your link above to see if I can get some help with this. Congrats on the new Cert!! I get enchanted every time I watch the video too. It’s its own form of meditation, so let’s give you credit for that today! #3 trips a lot of people up – we think when things are going right along, why bother with the inner climate? Then it blindsides you. D’oh! Thanks so much for your post and I’ll pass your video comments along to Greg – he’ll love it! Congratulations, Lani, on finishing your book and getting the certificate. Also, I’m happy for you that you got to go on that super awesome trip. Jennie, thank you! I appreciate you stopping in to comment so much! Anna, well, no wonder you are doing so well with an attitude like that! Glad you enjoyed seeing my list of food – it is a LOT when you see it all lined up like that! Appreciation your way, as always!